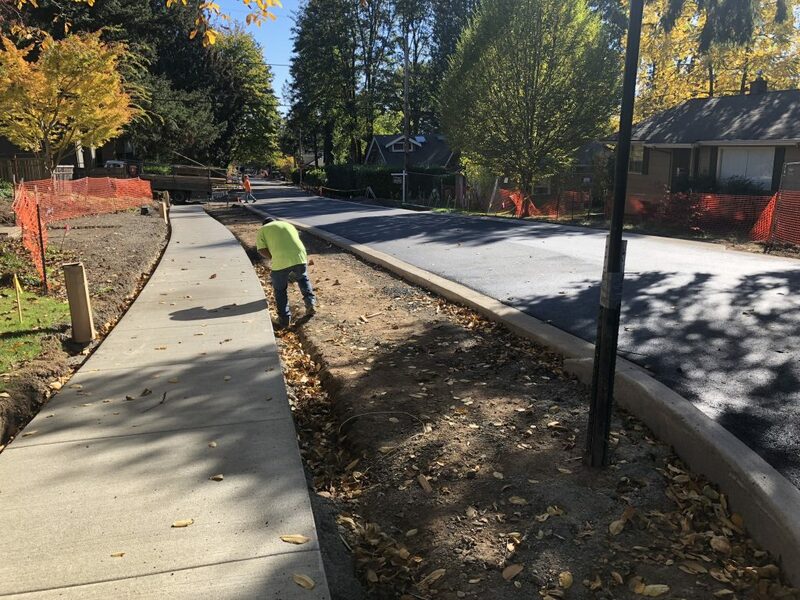 Thank you, D Avenue and First Addition Neighbors, for your patience, understanding and support while we have been building the new stormwater, water, pedestrian and pavement improvements this past year. Infrastructure affects all of us – it gets us to work, our children to school, captures and treats runoff, brings water to our taps and protects our public health. These resources improve our quality of life every day. Thank you for being part of these significant improvements! To say thank you to neighbors, please join the Project Team, Engineering, Public Works and Library Departments for a block party celebration! Let’s commemorate the one-year anniversary of breaking ground on the D Avenue Improvement Project and to celebrate National Public Works Week (May 19-25). Bring the whole family to get a behind-the-scenes view of Oscar the Street Sweeper, climb aboard an excavator, or watch a live video of a robotic camera inspecting a sewer pipe! Parking is limited at the library – please walk or ride your bike to this neighborhood event. *Please note, to provide ample room for event set-up, D Avenue between 4th and 5th Streets will be closed to all traffic the day of the event. This includes no on-street parking within the block. Thank you for your understanding! Major construction is complete, and most punch-list activities are finished on the project! Over the last two months, the project team has been monitoring and watching the new stormwater facilities, roadway, sidewalk and utilities. 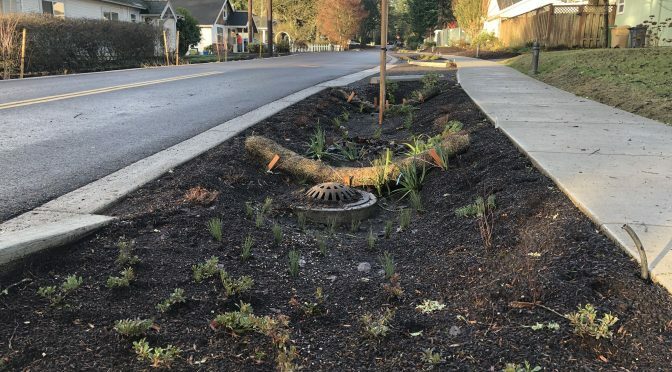 Small tweaks and adjustments have been made throughout the project area, particularly following the winter rains and storms. There are a few outstanding items that remain, some of these are a result of longer than expected lead times for materials. 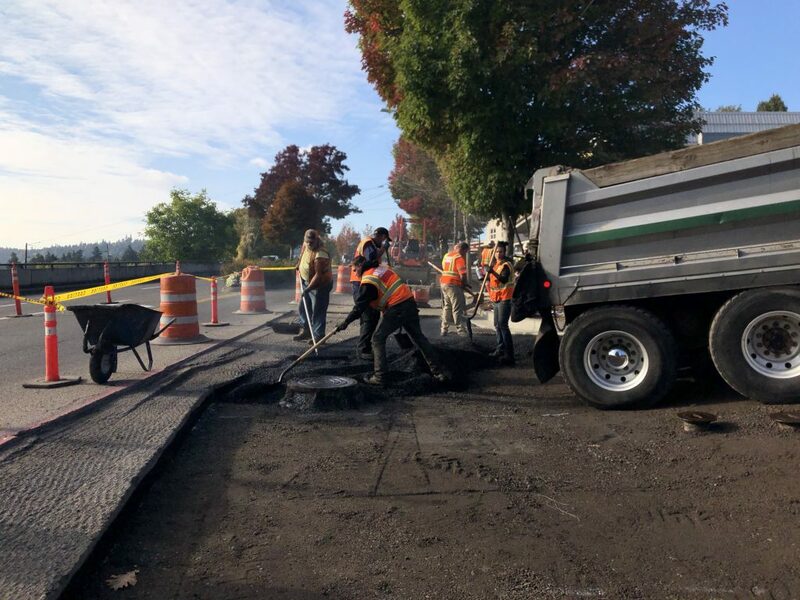 Crews are expected to return for one more substantial activity – installing additional trench grate drains along the south side of the sidewalk on D Avenue between 4th and 5th streets. This is to make some adjustments and additional improvements to the drainage in this area. This work will likely require a block closure during work hours, for about week. We will send an update out to neighbors prior to the closure. Landscaping and irrigation was completed in January. 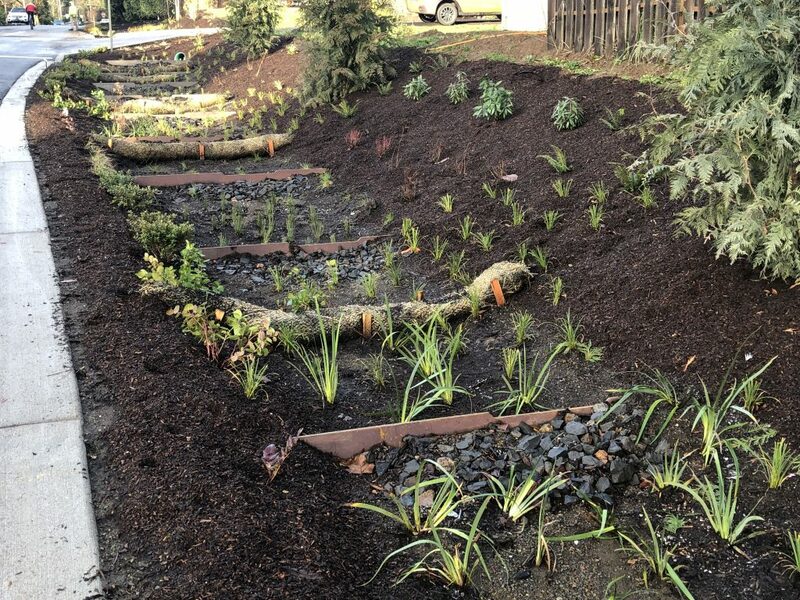 Cedar edging has been installed at the back of the new planters or stormwater facilities as a delineator. 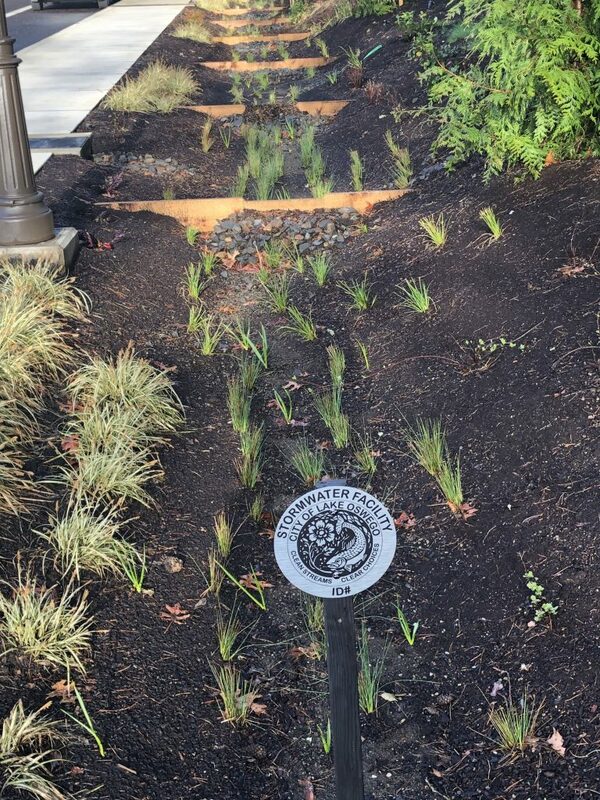 Metal identification markers will be installed shortly in each of the stormwater facilities and rain gardens. Watch for an information kiosk to be installed at the library corner later this spring, which links to the metal markers. PGE recently finished energizing the new street lights on the west end of the corridor. They still have some work remaining on the east end. While the City has no control over PGE scheduling, we have asked they make this work a priority. All work is now expected to be complete later this spring. Please note, there will be periods where no work activity will be taking place. Thank you for your continued patience! We plan on holding a street party celebration with neighbors in late May. We are collaborating with Public Works and the Library to make this a fun event for everyone. It will correspond with a one-year breaking ground anniversary from when we started major construction, and will also fit in nicely with National Public Works Week (week of May 20). Stay tuned – more information will be coming soon! Most major work is complete on the project! 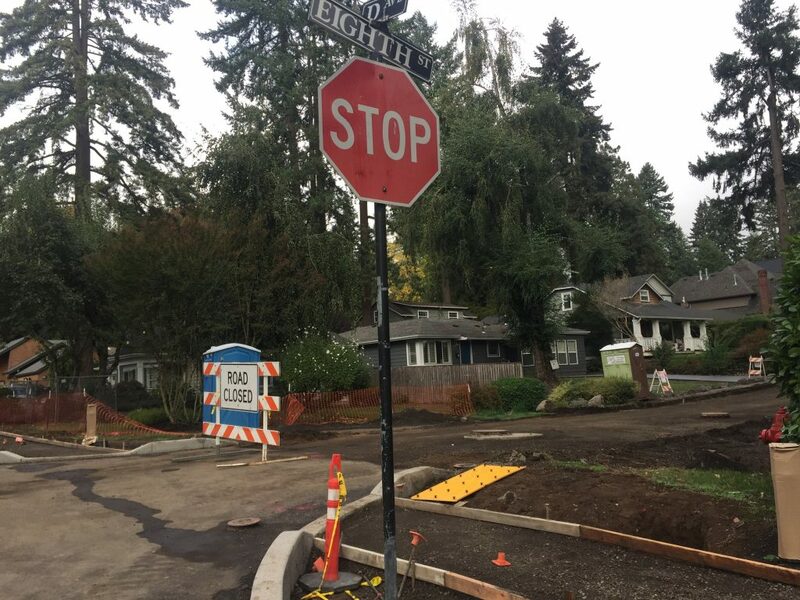 Thank you to neighbors for your patience as we have constructed these improvements in your neighborhood! Emery continues to make progress on remaining “punch-list” items, and expects to be substantially complete with restoration by early next week. Additionally, final tweaks are being made to certain areas of the project following the recent heavy rain events. 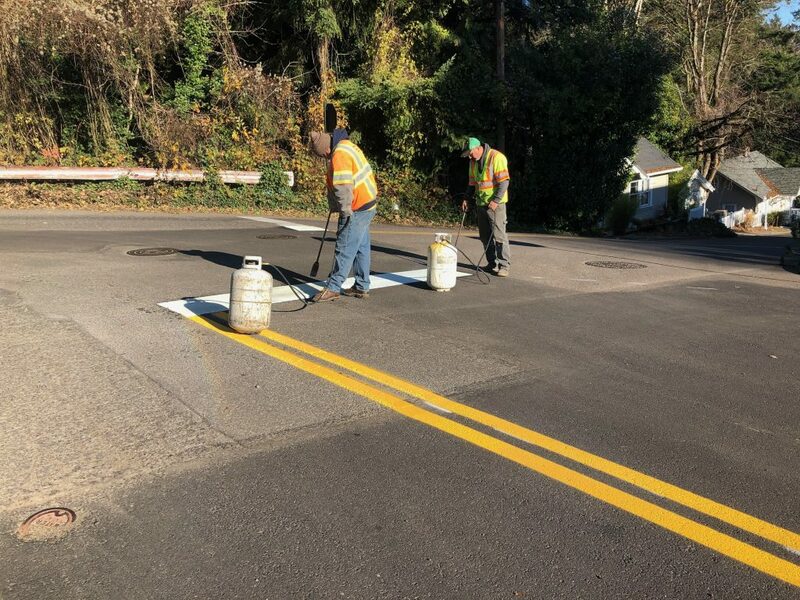 In early December, crews took advantage of a break in the weather to stripe the new stop bars and approaches. Parking aggregate has been placed in the parking areas along D Avenue. Street name signs are expected to be reinstalled in the coming weeks – crews are waiting on a particular part, which has delayed their placement. The landscapers have really ramped up their activities the past few weeks. 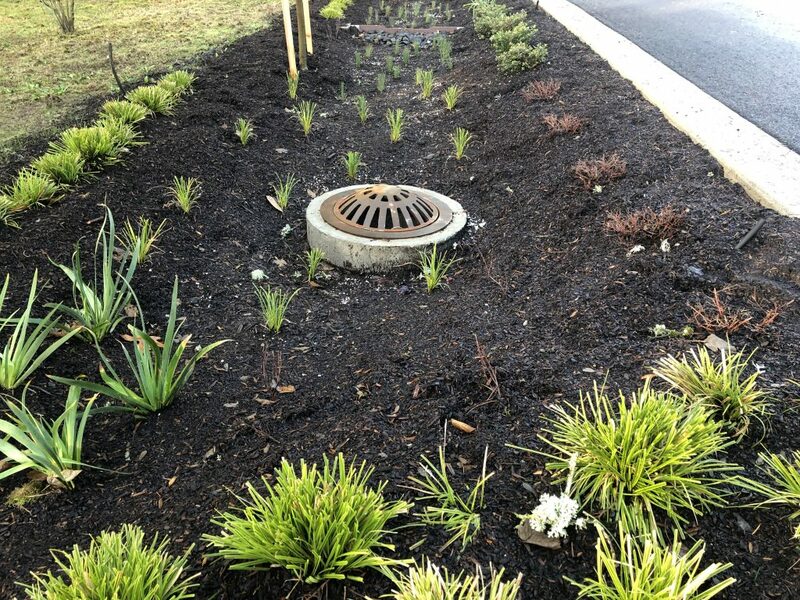 Soil and mulch has been placed in most of the new landscaped areas and stormwater planters. 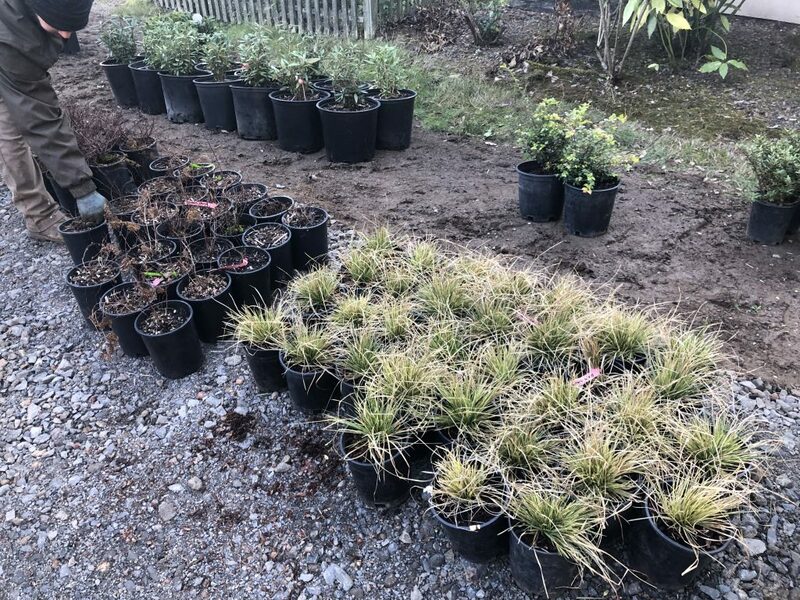 Large shipments of plants and trees are arriving and being installed throughout the corridor, helping to put the finishing touches on the new street and complete the transformation! 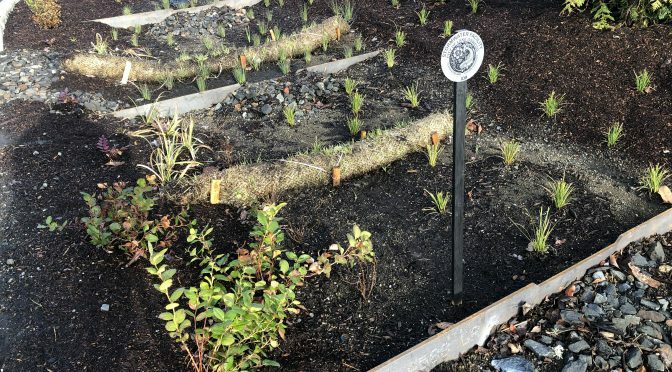 Crews are aiming to finish planting by early January. D Avenue between State and 1st Street remains closed at Highway 43 until major landscaping is complete in that block. Access is maintained for residents via 1st Street. In observance of Christmas Day and New Year’s Day, no work will take place on December 25 or January 1. All work is expected to be complete in early-mid January. Watch for an invite in the spring for a street celebration! 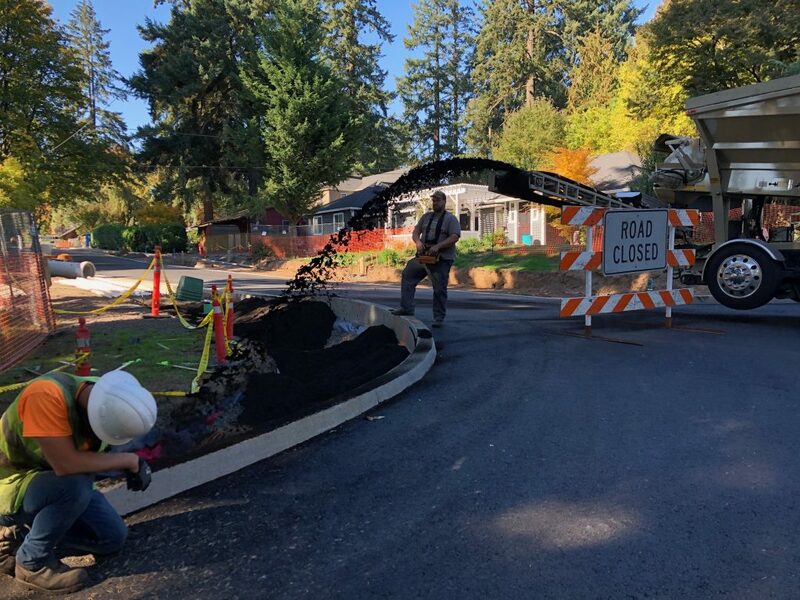 Over the last few weeks, Emery crews and subcontractor crews have been focused on a list of outstanding and miscellaneous activities throughout the corridor. Final concrete pours and clean-up work took place last week, which means the new sidewalk is now finished! This sidewalk provides a safe and much-needed walkable pedestrian route along the entire length of D Avenue, from State Street to 10th Street! The bollard lighting that will illuminate the new sidewalk has been installed. Inspections are taking place this week, and the new lights are expected to be energized by Thanksgiving. Intermittent daytime block closures continue along D Avenue. Please be safe and obey road closure signs. D Avenue between State and 1st Street remains closed until major landscaping is complete in that block. Access is maintained for residents. Emery is expected to finish their major excavation and earth movement work by Thanksgiving. 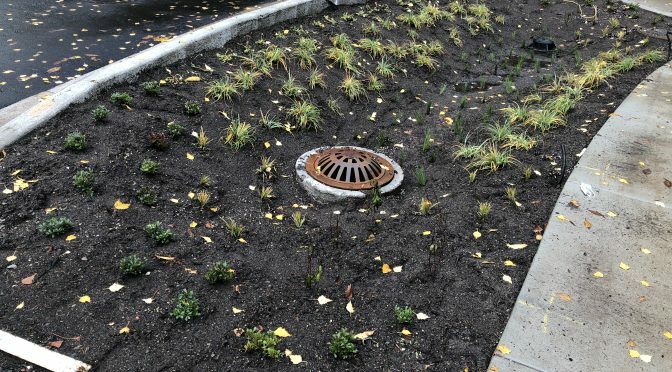 This includes preparing more than 40 stormwater planters, as well as other landscaped areas abutting the sidewalk (shown below) and parking stalls. 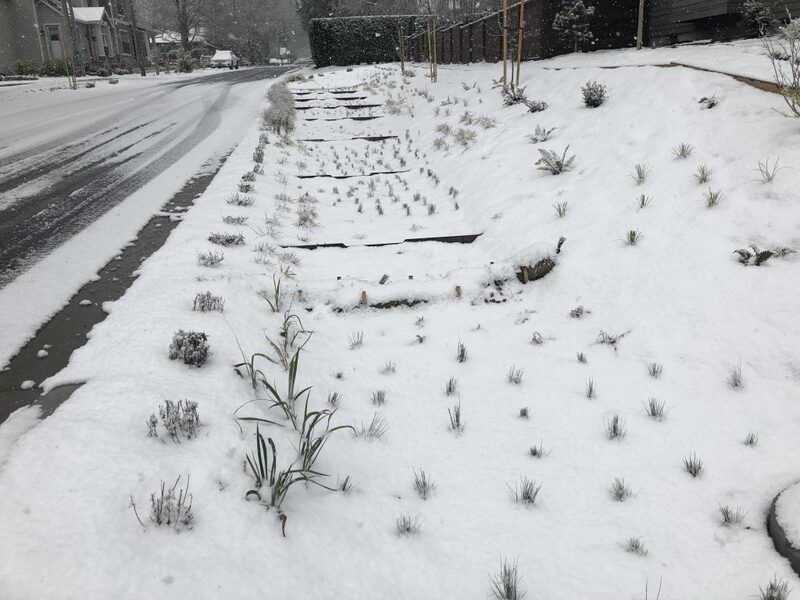 Due to landscape crew availability, soil placement and irrigation has been slow. We are expecting shrubs, trees and plants will begin arriving next week, and continue to be planted through December. This week, there will be a small crew working. No work will take place on Thursday, November 22, or Friday, November 23, in honor of Thanksgiving Weekend. General project wide clean-up and punch-list to-do items continue. 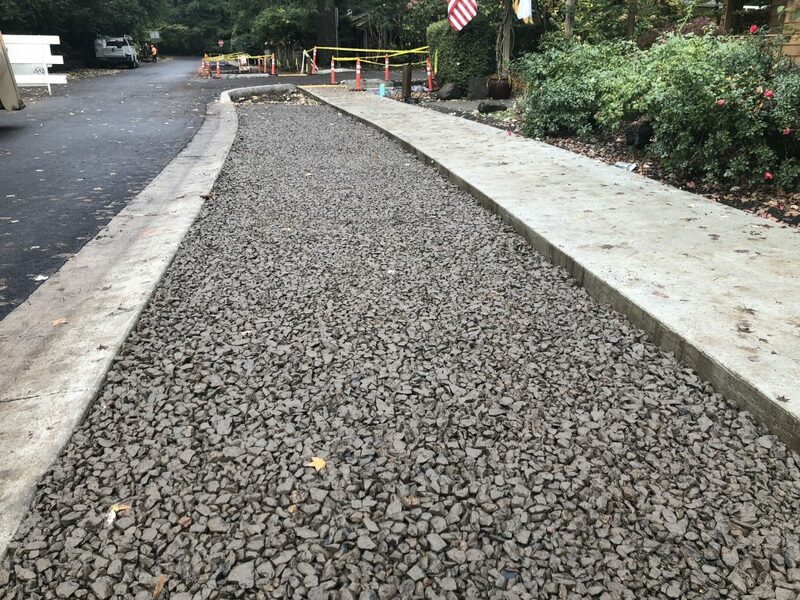 Emery has been installing parking rock aggregate in parking areas along D Avenue (shown in the first photo). Crews will also be placing bark mulch or hydro seed in areas that need to be restored. Pavement striping will be placed in the coming weeks. All work is expected to be complete in early January. The City and project team would like to hold a celebration with the neighborhood, possibly in spring 2019. This has been a mammoth project, one which we would like to commemorate with you. Although we anticipate all work to be done by early January, the spring might be a better time to hold a street celebration. Stay tuned for more information! Work on the project has ramped up significantly in the last few weeks. 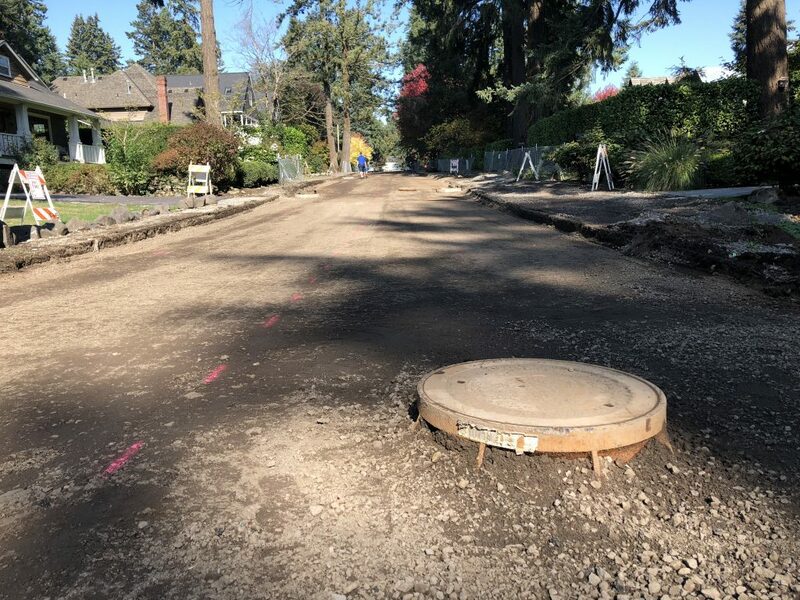 In addition to our primary contractor (Emery), there are as many as five subcontractors working along D Avenue, and periodic visits from PGE crews at any given time. Crews, each with their own materials and multiple pieces of equipment, are working from one end of the project to the other. For the safety of the workers and the public, daytime block closures will again be implemented along the entire ten blocks of D Avenue. Most N/S intersections will remain open. The closures are limited to daytime working hours (Monday – Friday, 7 a.m. – 6 p.m.). Access for residents with driveways on D Avenue will be coordinated. We understand this is an inconvenience, but safety is our top priority and the end is near! Earlier this week, crews placed the final top lift of asphalt on D Avenue. 8th and 9th Streets, between D and E Avenues were also paved, along with a portion of 7th Street and 1st Street. There are often circumstances beyond our control that affect construction schedules. Thank you to neighbors for your continued patience and understanding during the changing paving schedule. Weather permitting, crews plan to pave the alley approaches and remaining driveway approaches mid next week. Crews are progressing well with the new sidewalk. The areas where the sidewalk crosses alleys are being poured today, to allow enough cure time before Republic Services’ garbage collection next Friday. 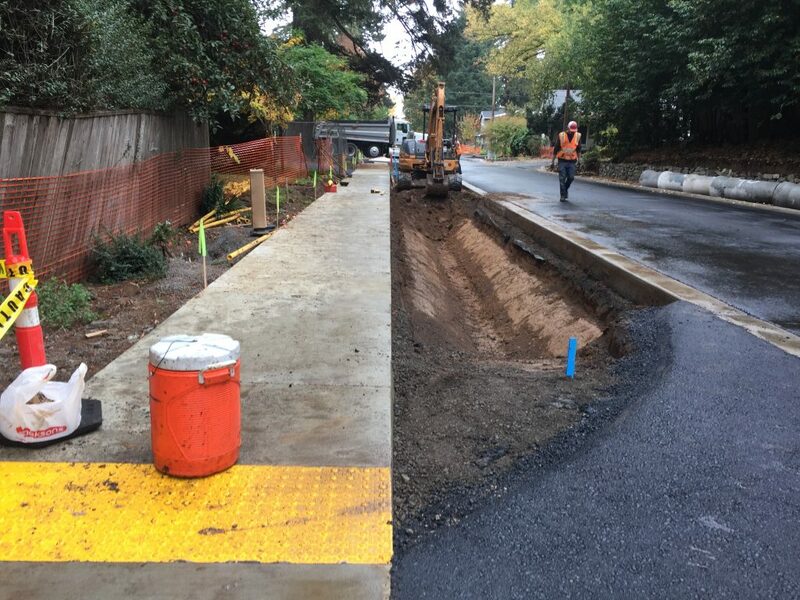 The new sidewalk should be complete by the end of month – just in time for Halloween trick or treating! Although the sidewalk will be complete, landscaping is just getting underway, so watch for open areas and stick to the sidewalk. 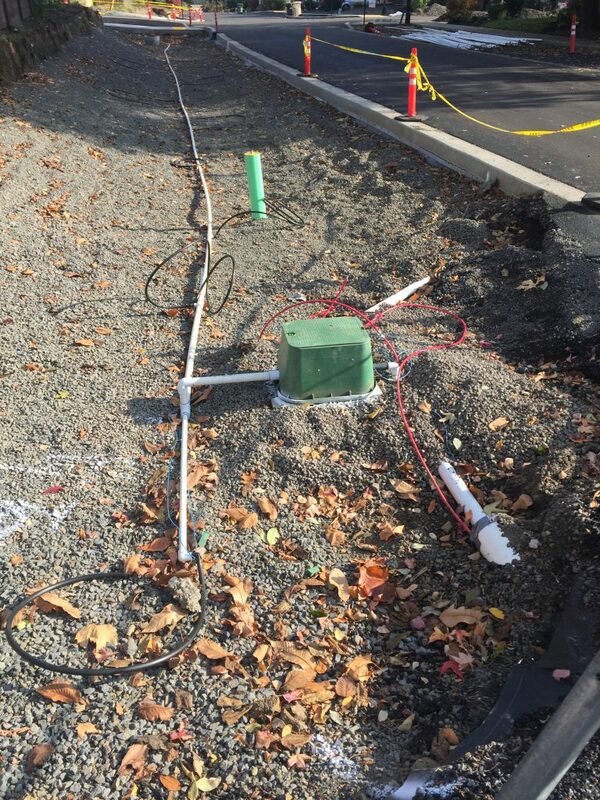 The electrical subcontractor is almost complete, and the new bollards will be energized shortly. 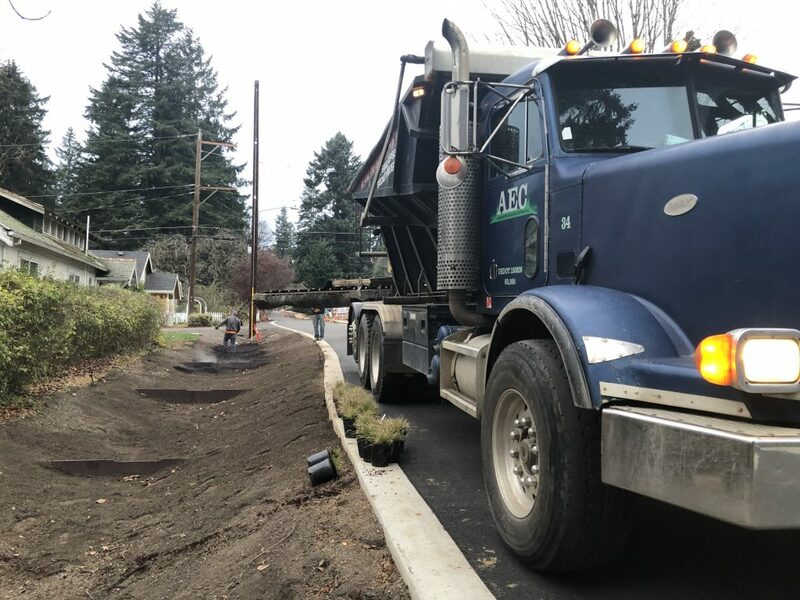 This week, the landscaping subcontractor has been installing irrigation and started placing some of the soil for the rain gardens and stormwater facilities. 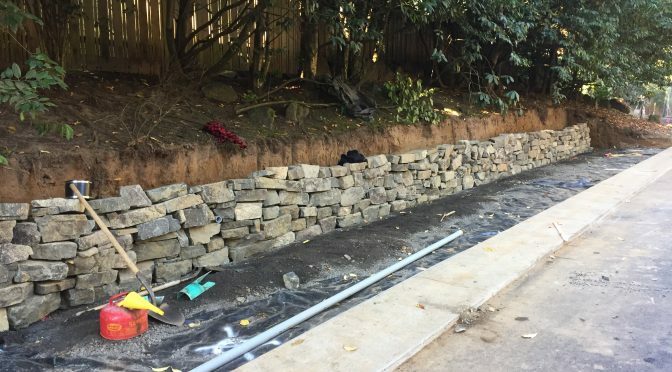 Neighbors may have noticed the large excavated areas along D Avenue – these are the stormwater facilities that will eventually be vegetated planters that filter the sediments and pollutants from street runoff, before sending it to Tryon Creek. These are layered with open graded rock (no fine material) that allows for storage volume. An 18-inch thick layer of planting soil will be placed on top of the rock, followed by the plants. 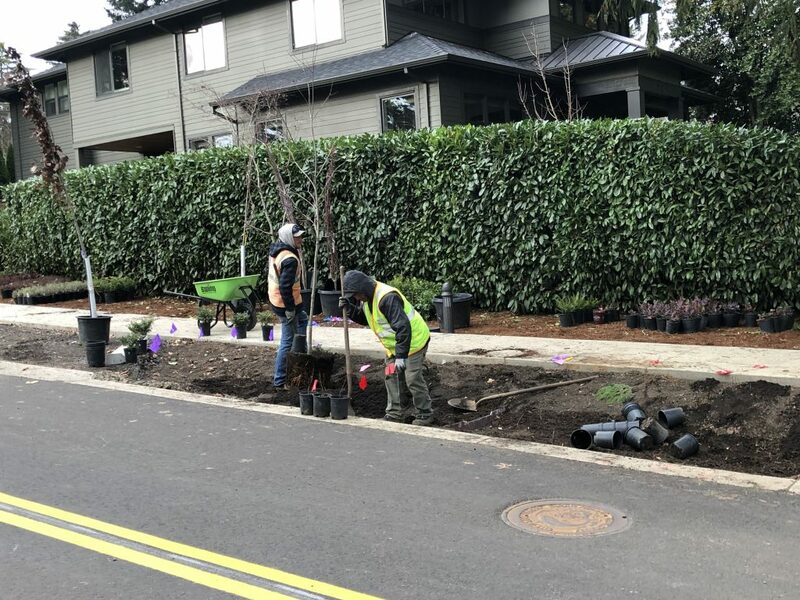 The finish grade of the planters will slope from the road edge to the center of the planter, allowing for appropriate storage and treatment of the runoff. 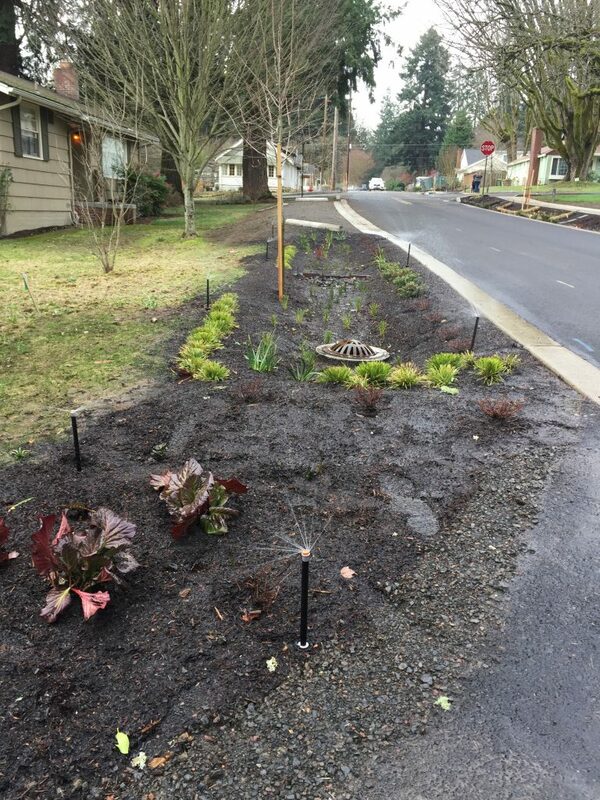 More than 40 stormwater facilities are being installed along the entire length of D Avenue. Miscellaneous clean-up, restoration and punch-list work will take place over the next couple of months. At this stage, all work is expected to be complete in early January. Due to a significant gas pipeline explosion in Canada, all asphalt plants in the Portland Metro Area were shut-down this morning by NW Natural Gas. 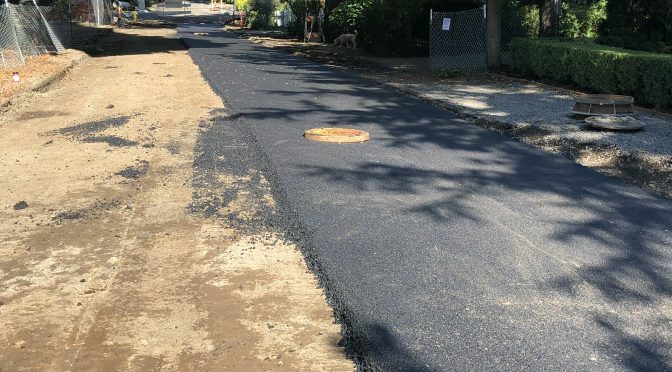 Paving crews were unable to receive enough asphalt, which has impacted the paving schedule for 1st, 7th, 8th and 9th Streets, and D Avenue. 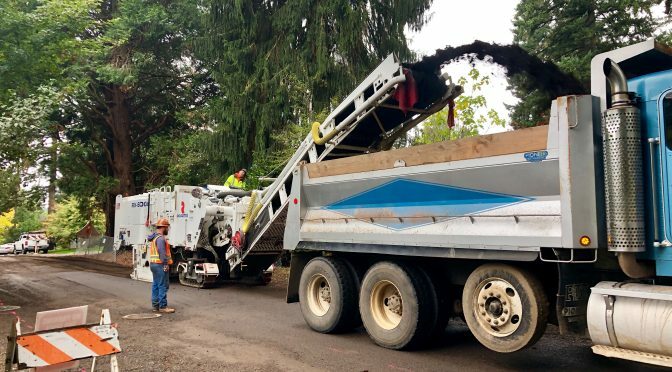 Crews were originally scheduled to pave today through Friday, but this is on hold as it is unknown when the asphalt plants will be reopened and producing asphalt. 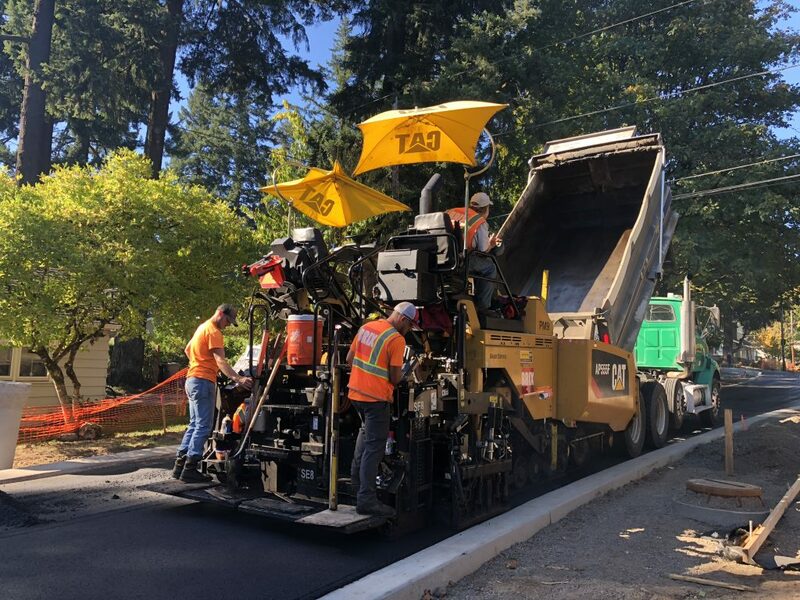 In preparation for final paving, the pavement on 7th Street between C and D Avenue, and 8th and 9th Streets between D and E Avenues, was milled and removed yesterday. The rough subgrade of the road is exposed, and any traffic on it will disturb the subgrade material (shown below). Due to the asphalt delay, these streets will remain closed to all traffic 24/7 until asphalt can be placed. 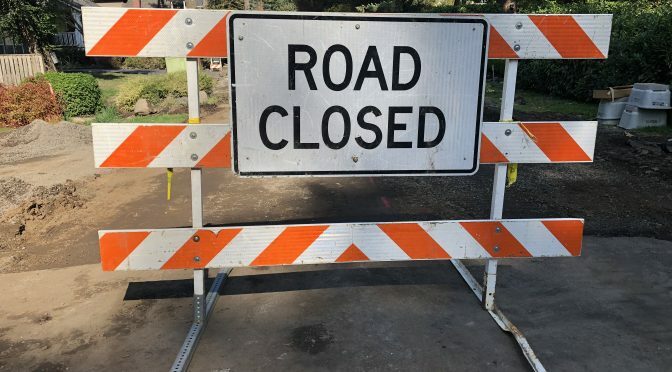 Given this unforeseen circumstance, work hours may be extended through this weekend – possibly including Sunday – to allow asphalt to be placed on these streets. We apologize for this inconvenience, and thank you for your understanding in this situation. Concrete crews are busy forming and pouring the new sidewalk and ADA pedestrian ramps along D Avenue. In order to stay on schedule, crews plan to work on placing forms tomorrow, Saturday, 10/6 along D Avenue. Saturday work hours are 8 a.m. to 6 p.m. 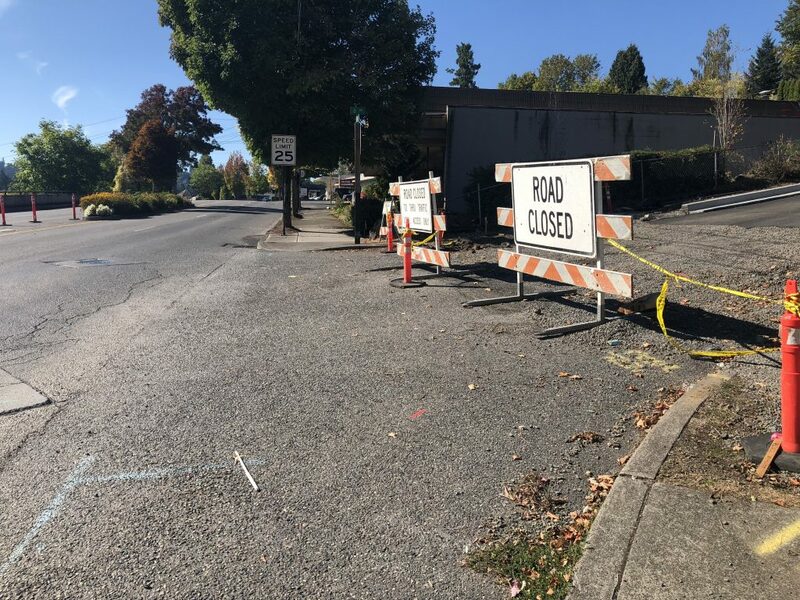 Yesterday afternoon, crews hit a gas line at the corner of State Street and D Avenue, which impacted the paving and concrete schedule for this intersection. Due to this unforeseen circumstance, the State Street lane closure has been extended through Tuesday, October 9. We apologize for this inconvenience and thank you for your patience as we continue to progress with this work. This week, Emery has continued to work on the stormwater facilities, prepared for the sidewalk and started building some retaining walls. The electrical crew has started installing electrical conduit and new bollard lighting adjacent to the new sidewalk location. This work will continue over the coming weeks. To meet compliance with the Americans with Disabilities Act, crews need to build new pedestrian curb ramps at the intersection of State Street (Hwy. 43) and D Avenue, and also repave this intersection. 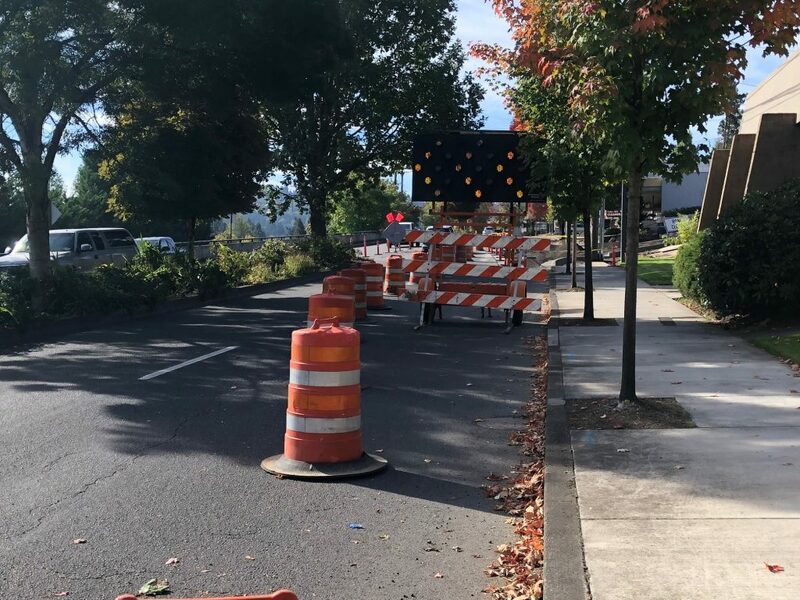 In order to safely conduct this work, the City is required to maintain a pedestrian route around the work zone, therefore, the outer (right) southbound lane on State Street at the intersection of D Avenue will be closed 24/7 from Monday, October 1 through Friday, October 5. Watch for merge ahead signage alerting drivers of the lane closure. Please drive with caution, plan ahead and expect delays during this temporary closure. Thank you for your continued patience as we progress with these improvements! Sidewalk Pours Begin Next Week! 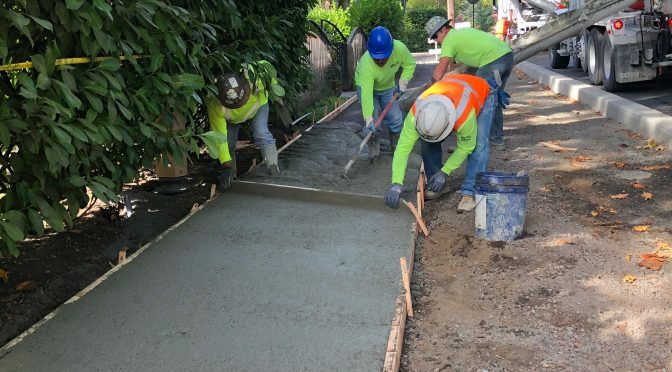 Due to scheduling conflicts, concrete crews are now expected to start pouring the new sidewalk next week, starting at 10th Street and working east. New sidewalk will be poured on the north side of D Avenue between 10th and 5th Streets, and on the south side of D Avenue from 5th to State Street. This work is expected to take at least three weeks to complete. If you live on D Avenue and your driveway will be impacted, you will receive a door hanger notifying you of the upcoming closure dates. 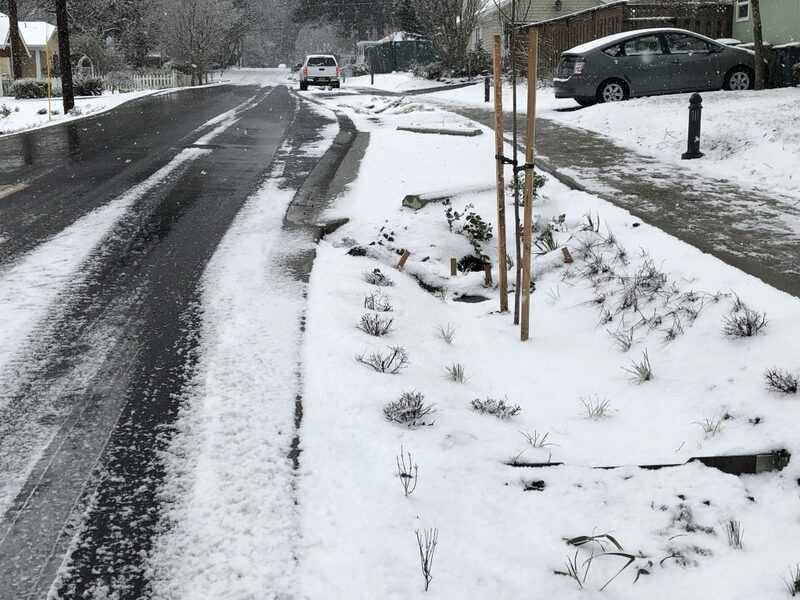 Please plan to move your car(s) out of the driveway before 7 a.m. on the day the forms are installed, and park on nearby a side street until the concrete has cured. Thank you for your understanding and patience! Many of the large stormwater facilities have been excavated and are ready for the next phase of work. 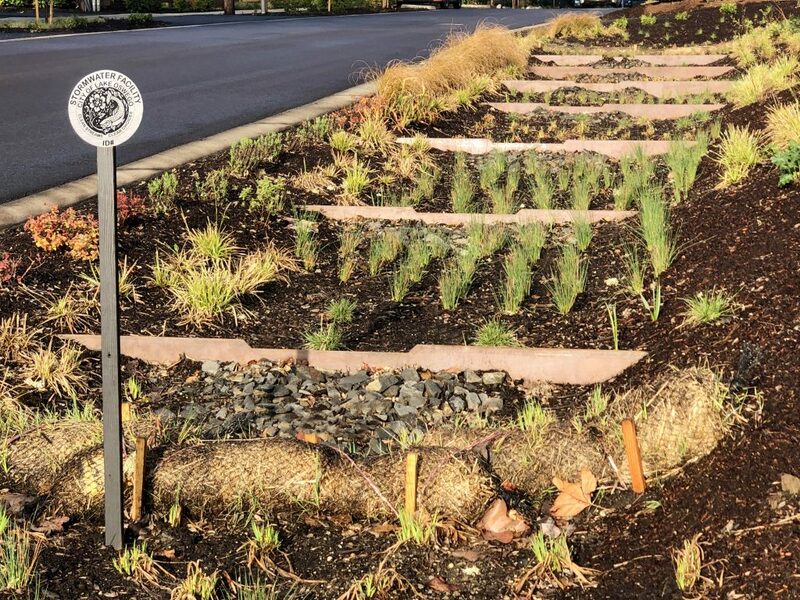 Landscaping crews will soon begin installing the irrigation system and the planting soil for the new planters and preparing for new landscaping. Weather dependent, placement of the final paving lift is currently scheduled to take place October 10-12. 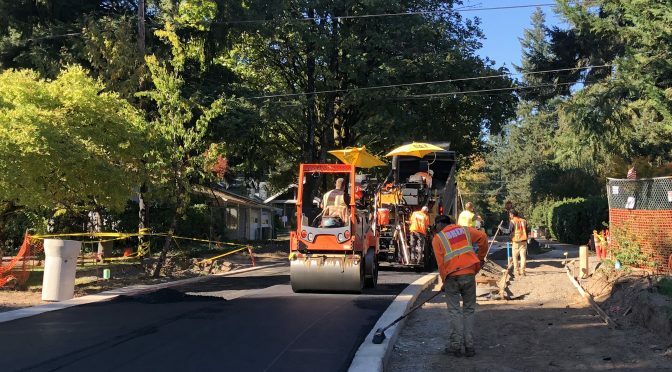 This work will also include paving existing driveway aprons on D Avenue, 8th and 9th Streets between D and E Avenues, and a portion of 7th Street near D Avenue.